In the footballing world, the term “long-term potential” is something that is thrown around quite a bit. While it usually applies to young and budding players who are looking to make their mark in the field, these days it also applies to the potential managerial maestros looking to guide a club to glory. A manager plays a significant role in deciding the incoming transfers, tactical nuances that define a team, backroom staff, and the club’s brand; he’s also responsible for implementing a holistic approach to the club; deciding the culture, the ethos, the training habits and every other minute detail you can think of. It is, therefore, no surprise that clubs go to incredible lengths to ensure that they hire the right man; someone who’s vision for the club lines up with their own and is truly capable of leading a club to success, on the field and off it. Many in the managerial field got there after an exhausting professional career, hanging up their footballing boots and boasting an abundance of experience. However, for every such manager, there are those who have gone on to experience incredible success without boasting of an extraordinary playing career. “The Special One,” Jose Mourinho’s footballing resume is one any coach in football would be jealous of. Aged just 41, he guided an unfancied Porto to an unexpected Champions League title; yet he’s never played football professionally at the highest level. And currently, there are many like him who are quietly going about making their mark, whether at the highest level or in the lower tiers of football who often do not get the recognition they rightfully deserve. Here, we’ve compiled a list of 5 people who we think are the realm’s finest managerial minds aged 40 and under, i.e. they must be born in 1976 or later. Standing at a mere 5ft 5in, not many expected Gallardo to be able to cut his teeth at the highest level, let alone carve a stunning managerial career out of it. Gallardo started out as an attacking midfielder for Argentinian side River Plate where he won 6 league titles and a Copa Libertadores. He also turned out for Monaco where he captured a Ligue 1 title and was voted the Ligue one Player of the Year in 2000. He also represented Argentina in 2 separate World Cups, amassing 44 caps and scoring 13 goals for his national side. He started his managerial journey with Nacional Montevideo in the Uruguayan Primera Division, guiding them to the league title in 2012. 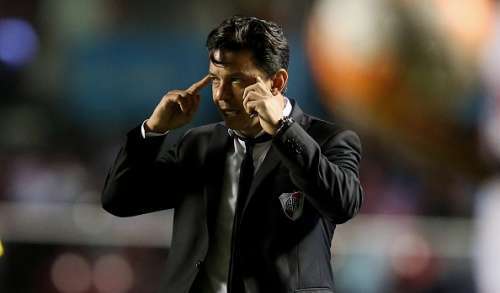 After making a much-heralded return to River Plate in June 2014 – a club that he captained – he has gone on to oversee a highly successful period at the club. He has River Plate playing an expansive, free-flowing style of attacking football molded in his own image, winning the Copa Sudamericana title in 2014. Last year, he went one better, beating Mexican side Tigres in the Copa Libertadores final and bringing the most vaunted club trophy in South America to River for the first time since 1996; coincidentally while he was playing for them. Though he did suffer defeat to Barcelona in the FIFA Club World Cup final, his time at River can’t be classified as anything other than a resounding success.